March 10, 2012 - It’s not unusual for cigarette smokers to take a few packs or even couple of cartons of smokes on a trip with them. But one passenger, who arrived to Washington Dulles International Airport Monday from Japan, learned that 924 packs may just be too many. Customs and Border Protection (CBP) officers seized the cigarettes for violation of 19 USC 1497, failure to declare, since the passenger, a lawful permanent resident of the United States, repeatedly declared possessing two to three cartons. Officers released the subject, who lives in Washington, D.C. 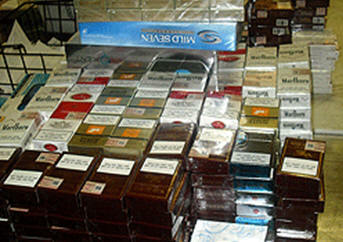 The amount of cigarettes, 18,480, seemed excessive for personal use and CBP officers suspected that the passenger intended to import the cigarettes for resale in the U.S.; however the passenger lacked an import permit from the U.S. Treasury Department’s Alcohol and Tobacco Tax Bureau as required by the North American Free Trade Agreement Implementation Act. The passenger, who flew from Vietnam to Japan and on to the U.S., initially admitted to possessing fish and cigarettes. A CBP officer referred him to a secondary agriculture inspection where an x-ray instead revealed a large quantity of individual cigarette packs in nearly all of his ten pieces of luggage. Officers inspected the luggage and counted a total of 924-loose packs of cigarettes, most wrapped inside blankets. Cigarette brand names included Marlboro, Kent, Craven, White Horse, Mild Seven and Esse. They were purchased in Vietnam. CBP routinely conducts random inspections operations on arriving and departing passengers searching for narcotics, currency, weapons and other prohibited or illicit products.